Mother Barbara McCoo Lewis of Los Angeles, California was elevated and appointed the International General Supervisor of Women Church of God in Christ by Presiding Bishop Charles E. Blake, Sr. and members of the General Board in April 2017. She stands on the shoulders of her predecessors as the seventh General Supervisor with a relevant vision in a Godly spirit of inclusiveness and purpose. Mother Lewis has served since 1988 as the Jurisdictional Supervisor of women in the Southern California First Ecclesiastical Jurisdiction. She is the visionary of a 4.7 million dollar 41 unit senior citizen complex opened in 2002. It was named Hale Morris Lewis Manor for the three succeeding Jurisdictional Supervisors of Southern California Jurisdiction One. Her efforts in juvenile halls and drug rehabilitation centers in Los Angeles earned her recognition from the Mayor and local newspapers as Woman of the Year. Her service on the national level is extensive including former women’s editor of the Whole Truth paper; twenty-three-year former member of the Board of Trustees of the C. H. Mason Theological Seminary; and member of the Presiding Bishop’s Executive Planning Commission. 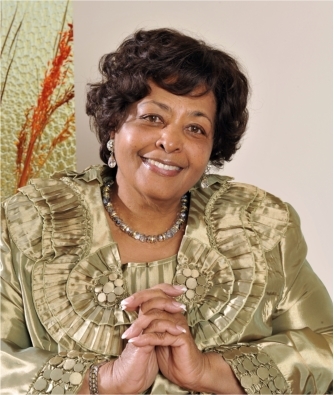 Prior to her elevation as General Supervisor Mother Lewis served as International Marshal of the Women’s International Convention, member of the Advisory Board and Executive Board, chairperson of the Special Convention Assistance committee , chairperson Department of Women Program Committee and chairperson of the Department of Women Executive Business Affairs. She was elevated as the Assistant General Supervisor to Mother Willie Mae Rivers in 2013. As a cutting-edge leader, Mother Lewis is passionate about the mission of the Church of God in Christ and is committed to its foundation and values. As General Supervisor, Mother Lewis has implemented numerous ministries and programs, including the following: Standardized Curriculum for Evangelist and Deaconess Missionaries; Procedural Manual for a Jurisdictional School of Licensing; Jurisdictional Supervisors Training Academy; separate Boards of Examiners for Foreign and Domestic Supervisors; separate training classes during the OT Jones Institute for Foreign and Domestic Supervisors; seven Scholarships in specialized courses of study named after each of the seven General Supervisors; National Department of Women directory; Administrative Assistant Wives Circle, District Missionaries Without Charge; COGIC Women’s Book Club; Policies and Procedures committee; support group for women appointed by their bishop to lead local congregations; on-line registration Women’s International Convention; call in prayer line during convention; children’s church; job fair, health fair, lawyer’s day, empowerment workshops and a senior love committee; six monthly prayer lines to meet diverse needs of women; urban initiatives; and expanded use of technology and communication tools to inform and promote events and programs. Mother Lewis is a renown prayer warrior, a prolific writer and author of the Christian Woman’s Guide to Church Protocol and Saintly Decorum. She has been married to Bishop James A. Lewis since June 1962 (56 years). They are the co-founders of the New Antioch Church of God in Christ in Los Angeles where their youngest son Administrative Assistant Jeffrey M. Lewis now serves as senior pastor (wife Floetta) . Their oldest son Elder James A. Lewis Jr works in the ministry along with their two adult grandchildren Shannon and Jeffrey Jr.